Increase your plant stocks by taking simple hardwood cuttings through Autumn. 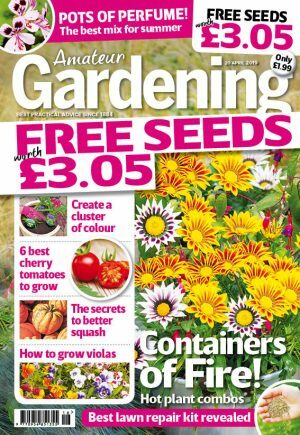 Our Amateur Gardening experts show you how. Hardwood cuttings are easy to take and, for most deciduous trees and shrubs, the best way to increase plant stocks. They are taken in the plant’s dormant season, best carried out after leaf fall, and before the plant starts to show growth in spring. The material used for these types of cuttings is simply the current year’s growth that has turned hard and woody. They will take more time to root and produce shoots than other types of cuttings, but the success rate is higher. A minimal amount of care is needed until the next year, as over the winter the cuttings will concentrate on callusing (a layer of plant cells which harden slowly and reproduce to form root cells). Step 1) Fill a large, deep pot with cuttings compost. Then select long stems of the parent plant’s current year’s growth – best about pencil thickness. Always cut just above a bud to encourage new growth. Step 2) Cut straight across the cutting at the base, below a bud. Make a sloping cut at the top, just above a bud. The cutting should be 6-12in(15-30cm) long from the base of the stem. Discard the top material. Step 3) Dip the base of each cutting in hormone rooting compound, then push into the pot of compost, up to half their length, firm in and water. In a cold frame or cold greenhouse the cuttings should root by next autumn. Alternatively, cover with a polythene bag and keep on a cool windowsill.